Discussion in 'Equipment' started by Bruce Spiegelman, Sep 12, 2018. Anyone? Thoughts? What did you change from? Differences? Size tank? Which Orphek? Kris in Pacifica the Orphek panels over his tank, check out his build thread? I have a v4 version 1 over my smaller tank love the coverage. What size tank? Any noticiable difference from other lights you've used re growth? Mines a 70 oceanic and it's mostly softies lps in that tank. It replaced ap700 I had over it and the coverage is awesome. Any difference in coral or algae growth? Hey Bruce, I’m sorry I haven’t been logging on often. Yes, I am using the latest Atlantik fixtures from Orphek. I absolutely love them. It was very easy to program a pleasing color from sunrise to sunset. I switched from all Kessil A360’s (7 total). I had great luck with the Kessils, and still have 4 along the back. I also use the backlit kessils to create the coolest, creepy night mode. It’s like bright moonlight. Never would have thought to utilize the two lights for effect, but it was the perfect accident. The corals freakin love the Orphek. I am getting even growth with Acro’s tabling properly. There is a shimmer effect (disco) if you stare directly at the sand. However, I learned to tune it out quickly, and it doens’t bother me at all. I think the Kessils might take away some of that effect? The fans are about the same noise level as the Kessils. I feel they are very quiet. The 4 preset “Channels” of light are mostly good. For some reason there are quite a few green LED’s in one of the channels, so I keep that one very low. I don’t like the green effect at all. Another channel is the UV bulbs. There are several different levels, and it creates a pretty trippy effect, both during the day and at night. I LIKE! HOWEVER........ I can only run it at 40% or below.......otherwise it’s an algae nightmare!! At 40% the look is still nice though, so I use that as my compromise. Overall, I am super stoked on the lights. I like the more even coral growth and am really happy with coral colors. You are welcome to come by and check em out. I'm actually considering one for a new SMALLish frag tank. Thoughts? Wow Kris, your aquascape has changed quite dramatically from the last time I was over there and saw your tank. I think it will give you great coral growth and color. If it’s a shallow tank, you probably don’t want to run it more than 60%. Mine is 25” and I max out at 80% for a few hours each day. About 12” off the water. 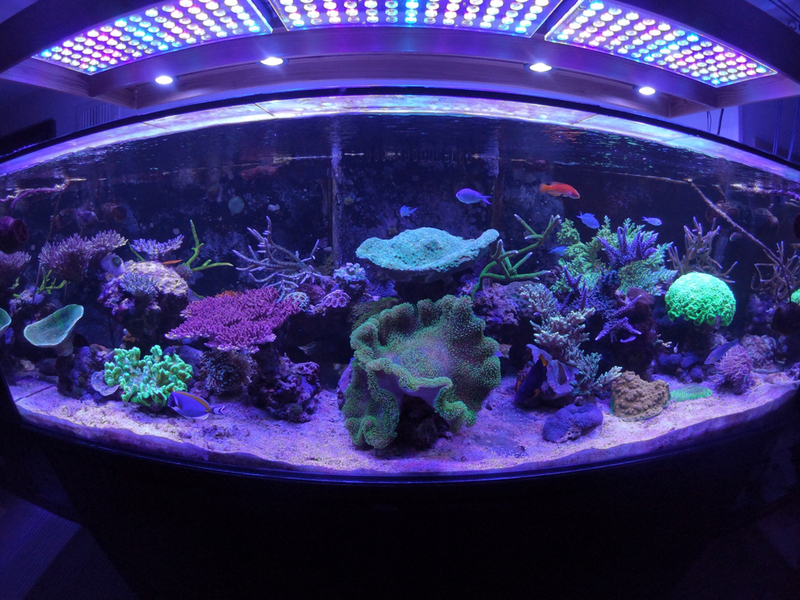 On a side note, I have a kessil AP700 over a 4’ x 2’ x 12” deep frag tank. It covers ok, but mostly LPS on the far edges. I discovered that running it on the most blue heavy pre-set is giving me great growth and color, and has eliminated the algae all together. Corals still look great, but Caroline algae doesn’t grow. It’s odd, but nice not to have to clean the front plexi. Tried to delete a double post, and it double deleted. Anyway, yes..... I went crazy on the landscape. I’m digging it.